The project is focused on inscriptions and inscribed monuments that were displayed in public (and semi-public) areas of antique and medieval cities of the Mediterranean region. These include mainly texts carved in stone but also inscriptions made of other materials such as bronze, wood and mosaic. The project is using an interdisciplinary approach and consists of three sub-projects, that are all dealing with central questions of the SFB – such as the materiality of texts and artifacts, their topological position in urban space, and moreover the diverse modes of perception and reception they evoked, ranging from seeing and reading them through to reusing them in secondary contexts. With regards to chronology and geography, the project spans a wide range from hellenistic Minor Asia to late antique Africa and the Levant to the medieval cities of the northern Mediterranean. This wide research margin was chosen intentionally in order to enable the reconstruction of continuities and changes more easily when dealing with script-bearing monuments. 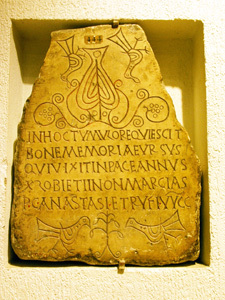 Shifts in the use of media and their contexts are especially interesting, as in the case of the transformation of the antique epigraphic habit from an urban phenomenon to a dominantly funerary custom during Christian Late Antiquity or the revitalization of a public epigraphic culture in the medieval communes located in the area of the northern Mediterranean. All sub-projects are using new methodology: On the one hand, they are concentrating on the specific material manifestation and the contextual placement of the inscriptions and inscribed monuments. On the other hand, they investigate the intended messages, also taking into account how the ancient and medieval audience might have perceived them. In doing so, the inscriptions are understood as “actants” with a specific “affordance” that influenced their environment and animated the observer and reader to certain activities. It is fundamental research based on detailed material analysis and spatial recontextualization which makes possible this methodological approach and which will result in new forms of databases and (digital) editions. Anyone who went about an antique town was constantly and automatically confronted with inscribed and described monuments. The original interaction between the content of these texts and their characteristic materiality has, however, frequently been overlooked in the research into epigraphy in the ancient world and in archaeology. The material appearance of the text-bearing artefact in its spatial setting, its presence in relation to other epigraphic and iconic monuments, or its perception by the beholder has rarely been investigated. This sub-project aims to eliminate the unjustified distinction between written word and inscribed artefact by researching the presence, semantics and reception of script-bearing monuments or monumentalised inscriptions within their specific contexts. As of now, an inscription is no longer to be grasped as a ‘mere’ text but as a visually significant artefact whose cultural meaning is determined quite decisively by its contemporary perception and assessment. In order to grasp the antique culture of inscription as holistically as possible, i.e. in its roots, its processes of transformation, and in the cultural trajectories of its meaning even beyond the boundaries of the epochs and territories, the sub-project is divided into three separate studies with three different chronological and geographical foci: while the first segment deals with artefactual written matter from classical and Hellenistic Athens, the second study examines the demise of the traditional culture of inscriptions in the Roman Empire during Late Antiquity and early Byzantine times. Finally, the third segment has taken a case study to investigate the recontextualisation of the writings found in Pompeii and Herculaneum.